The servlet context parameter example shows you how to use the servlet context parameter to inject in a servlet. Although, we can do these stuff with annotations, but we try to give you one more way to resolve this issue. Beside, we use the context parameters so we can define them globally for all servlets inside the web.xml servlet descriptor. 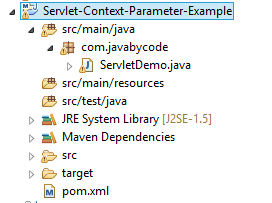 This is fourth post of series of Java Servlet Tutorial. This series tutorial will provide you full knowledge about Servlet 3.0. The main focus of this tutorial is the way of Servlet Context parameter definition. If you intend to configure servlet context parameters for global servlet parameters you must store them in somewhere of project. With annotation we have no way to include them. That is why we need to configure the servlet context parameters in the web.xml. We will get the result such as the below image.